Some people might find fantasy sports boring. After all, they say, fantasy sports focus on statistics, more statistics, and nothing else. Many feels that it takes away from the appreciation of the game and just revolves around numbers. This is true, to a certain extent. However, I feel fantasy sports can only make someone appreciate sports more. Instead of reading only your home team's box scores, you read box scores from the entire league. Instead of flipping by a Flames-Ducks game at 10:30 pm on ESPN2 that you would otherwise care less about (especially if you're a Flyers fan), you might actually stop to watch it to see how your favorite players are doing. You get to learn more about a player's strengths and weaknesses. I've learned a lot from fantasy sports. For instance, just because a pitcher has a low ERA doesn't mean he's a great pitcher if he walks every other batter (David Coggin comes to mind). 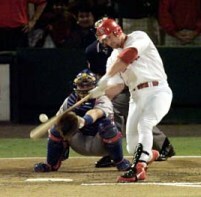 Just because a batter hits a lot of home runs doesn't mean he's doing a great job (*cough* Mark McGwire *cough*). And stolen bases might be more helpful to your team than you think (Ichiro Suzuki, Jimmy Rollins). PHOTO CAPTION: Mark McGwire was a player who could help your fantasy team with his mammoth home runs, but hurt it with his low batting average and high number of strikeouts. Fantasy sports taught me patience as well. My Yahoo! Fantasy Baseball team was in 12th place in a 12-team league as summer came along. Instead of abandoning my team like some fantasy owners, I continued to work to improve my team and they ultimately won the championship. Sure, there are moments in fantasy sports when you don't know what to do (like when your closer is pitching to your third baseman, or when someone from your favorite team actually helps out your opponent's fantasy team). However, the experience is all worthwhile, even if your CBS Sportsline full-season fantasy baseball team starts out 3-1 and ends up 8-14. It's even fun when you're playing in a non-money league, where the sole prize is bragging rights. But just as long as you're having fun, that's probably all that matters. This article was written October 13, 2001.